There’s been a lot of talk lately about Net Neutrality and why it is or is not a good thing. The confusion comes from all sides: liberals, conservatives, the media and even Internet Service Providers (ISPs). This article will hopefully sort the Internet out for you. So how do we get the Internet sorted? Well, first off, The Internet is not a thing. It does not exist. There is not a building you can visit to see the Internet. It’s not a governmental entity, it’s not a multi-national corporation, it’s not even your computer. It’s none of those things and all of them at the same time. Your computer is like a skin cell, the multinational corporation is like the muscle cells in a hand, the governmental agency is like the bones in your thumb, and all of it together is a single thing we call a body. I guess the best way to explain the Internet is to follow a typical Internet activity. Not yet. First your computer connected to the Internet. It either connected directly through it’s own modem, but more likely it connected through a router/modem provided by your Internet provider. The modem part connected to the Internet Service Provider (ISP) and was assigned a Domain Name Server (DNS) to help it navigate. There is a main DNS server for every Top Level Domain or TLD (.com .org, .ws, .tv, etc.). This is not the one you connect to. The authoritative TLD DNS server has a list of where every domain registered is supposed to be. So when I registered evandavis.org, my registrar added an entry on the .org TLD DNS. 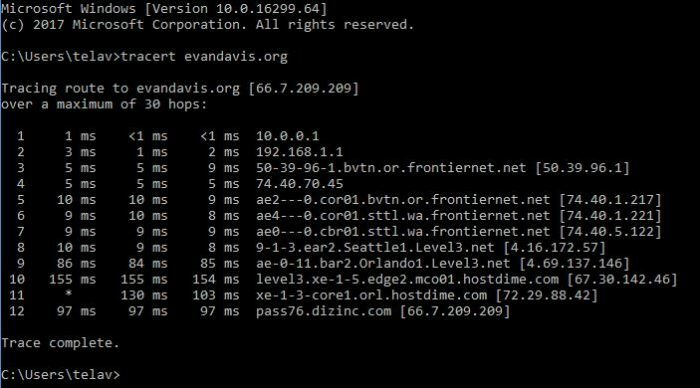 So when your browser asks your ISPs DNS server where evandavis.org is, first it checks its own records for evandavis.org. If the ISP DNS does not have it, it will go up to the next DNS and ask and so on till it either finds it or gets to the .org TLD DNS. And then it gives me the page? Nope, it only tells you where it’s supposed to be, which in the case of evandavis.org is at ns1.telavir.com (which is another DNS). Your browser then goes to that DNS and asks or evandavis.org to which it will respond 66.7.209.209. Your browser will then go to 66.7.209.209:80 (the 80 is a port for http) for the page and my web-hosting server will respond with the default web page for http://evandavis.org. It is. Go back and read that if I went to quick because I’m going to go into more. The ISP, ISP DNS, TLD DNS and 66.7.209.209 are all owned by different companies that are connected to each other through other companies. So that’s a minimum of 3 companies just for me to access my own website. Yes. The network of interconnected companies that host fiber optic cables, copper lines, DNS servers, hosting servers and even your own computer are the Internet. Next Post Next post: Who owns the Internet?